Why on Earth would you buy one Wi-Fi smart plug for between $25 and $30 when you can get a smart power strip with four Wi-Fi smart plugs for even less money? 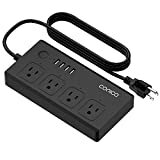 The Conico WiFi Smart Surge Protector is a fan favorite among our readers, and it normally sells for $31. Sales generally drop it to the low $20s, but we’ve got something special for you today. Use the coupon code 5F6BCXQN at checkout on Amazon and you’ll get it for less than $20! That’s a crazy deal that you definitely don’t want to miss. Supports Voice Controlled: This Wi-Fi power strip can sync with the Alexa/Google Assistant for voice control after connecting the Jinvoo Smart app successfully. You can voice control 4 smart AC plugs individually on Jinvoo app with Amazon Echo. 4 Individual Control Smart Outlets: Conico smart surge protector with 4 usb charging ports and 4 smart AC plugs. You can control these smart plugs individually through Jinvoo Smart app. Intelligent Auto Timing: Equipped with timer for each wifi plug on this smart power socket, you can set it up to control your lights automatically. Even you are in business trip, you can set up your lights turning on/off randomly seems like you are at home. Surge Protect for Home Appliance: Supporting surge protection with overload protection protects against spikes and fluctuations, it will protect the connection equipment from damage. Plug it into the wall outlet, when the blue indicator flashing 3 times per second, please follow the instruction to add it. Conico Smart Power Strip has been approved for safety and quality assurance (FCC and ETL certificate). Contact us if you need assistance.